OP-4T1 / Optimux-4T1 is a multiplexer combining up to four T1 channels over a single fiber optic link. A pair of OP-4T1 / Optimux-4T1 units offers simple and low-cost connectivity for four T1 channels at distances up to 75 km (46 miles). 1300/1550 nm for single fiber, WDM (Wavelength Division Multiplexing) operation (standalone version only). An optional second link provides backup, using automatic switchover upon main link failure. An optional second power supply provides power redundancy and fail-safe operation. OP-4T1 / Optimux-4T1 transmits each of the T1 channels independently, so that each T1 channel can have a different clock source. 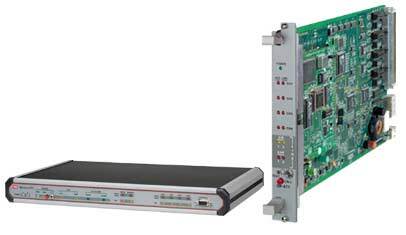 OP-4T1 / Optimux-4T1 is also available as a card for the LRS-24 19-inch rack with central SNMP management. This option provides a compact, cost-effective central solution. To facilitate system diagnostics, OP-4T1 / Optimux-4T1 features LED status indicators, AIS alarm generation and recognition, and dry contact closure upon link failure. Setup, control and diagnostics can be performed via a supervisory port using an ASCII terminal, or a SLIP connection to an SNMP management station. Optimux-4T1 in the LRS-24 rack can also be configured, maintained and monitored over Ethernet, via the LRS-24's CL-2 card. RADview-HPOV running on an HP OpenView UNIX platform. A voice service channel is available for end-to-end communication between maintenance personnel. The standalone Optimux-4T1 is available as a compact 1U high unit that can be mounted in a 19-inch rack. Note: When ordering AD power supplies (one AC and one DC) DO NOT specify R for a redundant power supply. Note: For single fiber connection (WDM), one of the units should be ordered with SF1 and the other with the SF2. Default is one link only.